Where do I start? First off, I checked my Twitter and saw a random tweet about how Paul McCartney is needing thirty people to help film his stay at Citi Field and that the first who reply will be chosen. I nonchalantly send an email with the mindset that thousands more will reply before I do. Ironically enough, I received an email stating that I had been chosen and I had to be at the stadium by 7:45; it was nearly six and I was not ready. I hopped up, got ready and bolted to the subway. And, as they say, the rest is history. Let me first just say that Citi Field was quite the sight and turned out to be an awesome venue for a show this size. Equipped with my 'Working Personnel' pass, I walked down to the field and searched for the right spot. Despite having a few quarrels with security, who apparently didn't know what were doing and what access we had, I finally made my way up front. 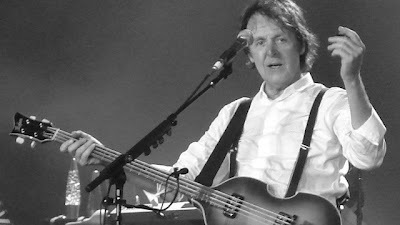 Sir Paul blazed through an outstanding set list that included many Beatles' songs, as well as his own hits. To me, seeing and hearing the Beatles' songs being performed by an actual Beatle was beyond spectacular. Of course, Paul dedicated songs to his late band mates, George and Paul, and his late wife Linda. One might think that these were somber moments but they were actually joyous tributes and were enjoyed by all. And when the mood was happy, the place was rockin'. What am I saying, the place was rockin' the entire time. McCartney also had some help in Billy Joel, who joined him onstage for "I Saw Her Standing There". That was just the icing on the cake. This was truly an amazing event and is definitely in contention for the best concert I have ever been to. Paul McCartney is truly a legend and an outstanding showman and I consider myself lucky enough to have seen him.